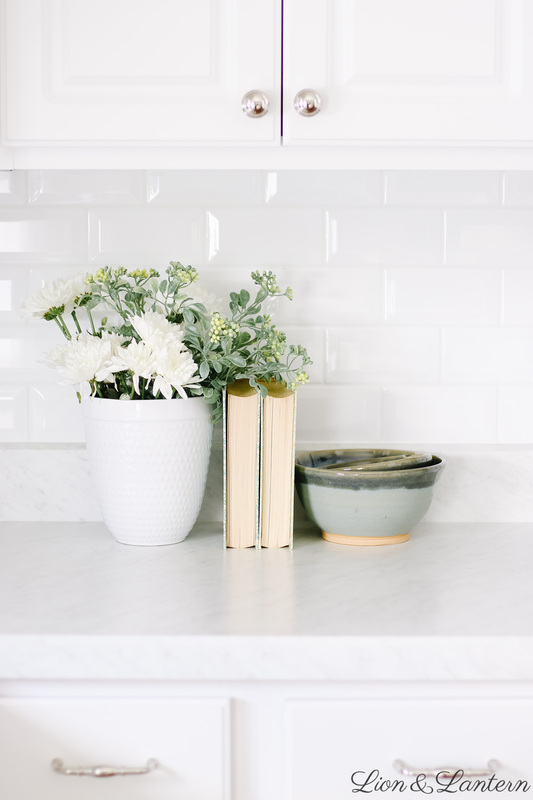 Take your white kitchen from bland to beautiful with simple accents like thrifted books, baskets, handmade pottery, and fresh or faux greenery. Best of all? 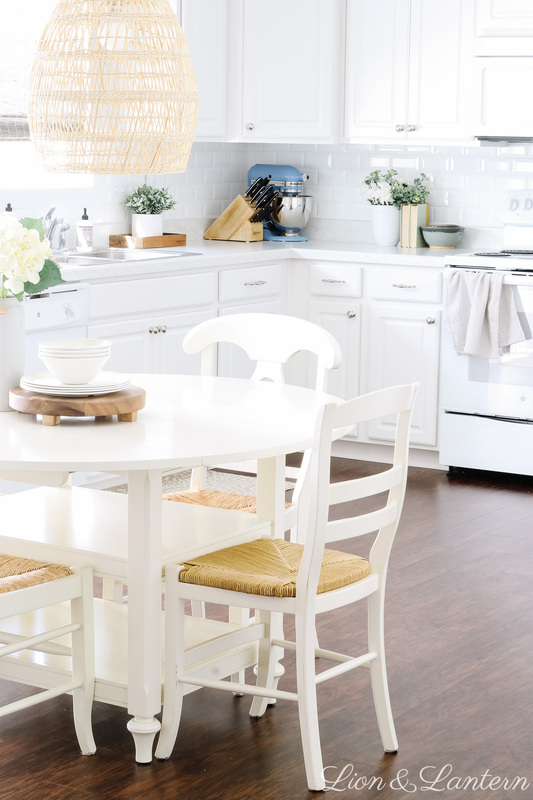 This transformation is budget friendly! Welcome, friends! 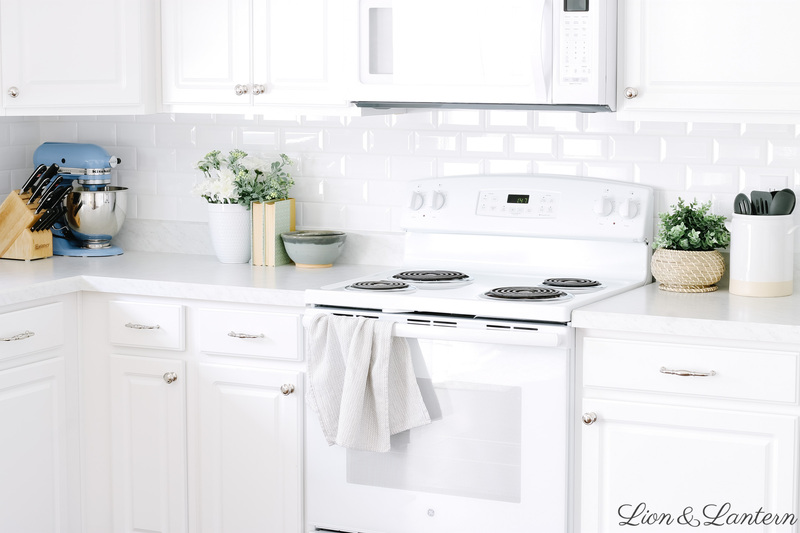 Today I’m sharing simple tips for adding character and texture to your white kitchen. So glad to have you, let’s get started! 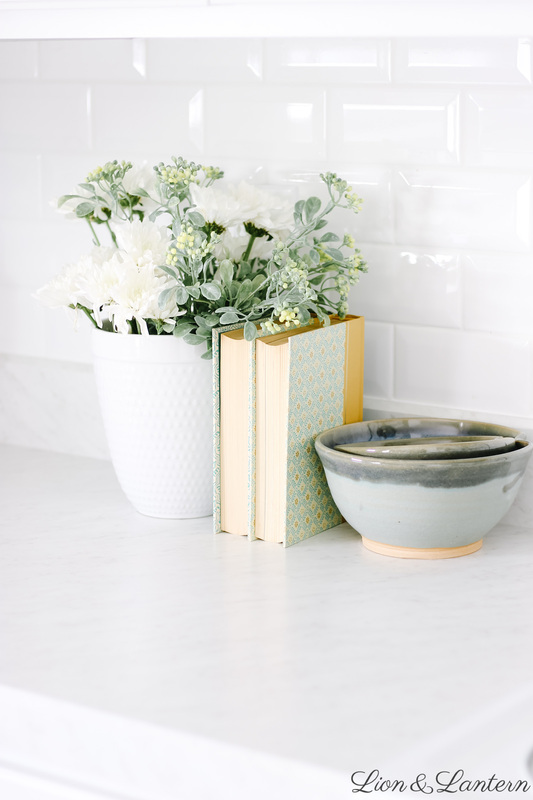 To see more of our spring decor, check out my Spring Home Tour 2019! To begin, I thought it would be fun to take a look back at how far this space has come. Here is a not-so-great phone photo of our kitchen when we first moved in a little over two years ago. 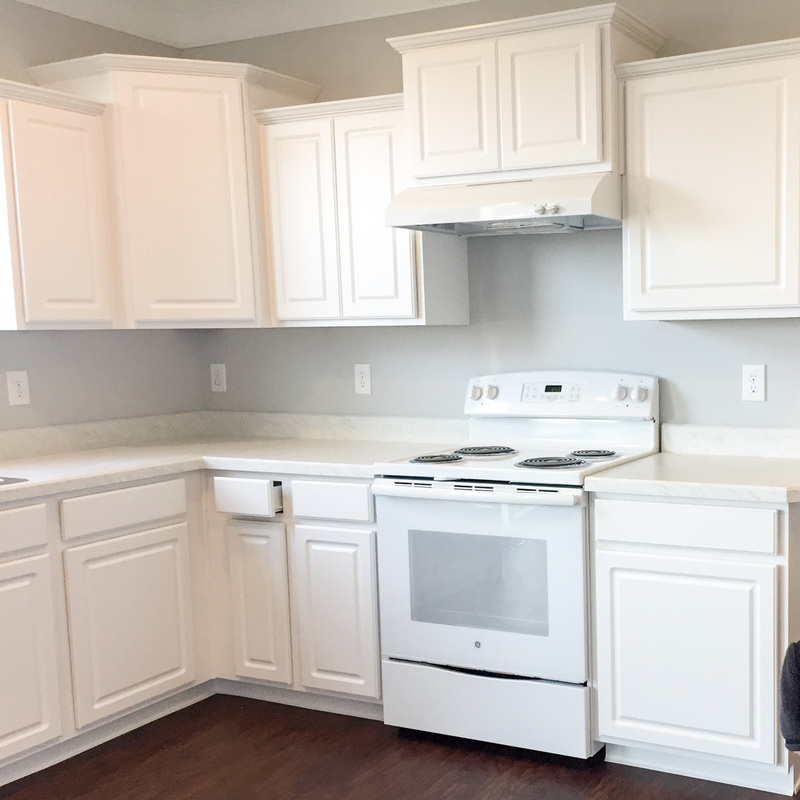 We decided not to have a backsplash installed at the time as it was pricey, and our builder actually did not offer cabinet hardware, so everything was very bare bones. About a year later (so, one year ago!) 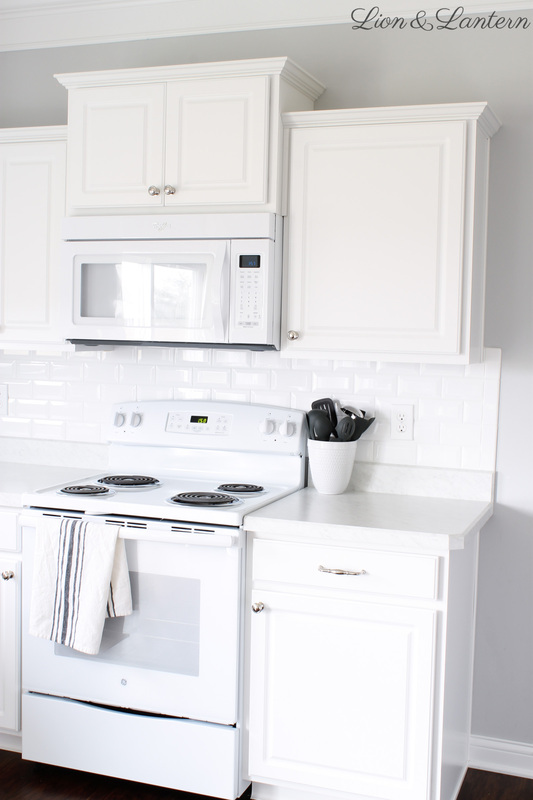 we had beveled white subway tile and polished nickel hardware installed. It made such a big difference! 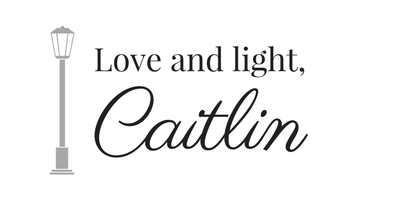 You can find the blog post here. Fast forward another year, and I am so pleased with our kitchen today! 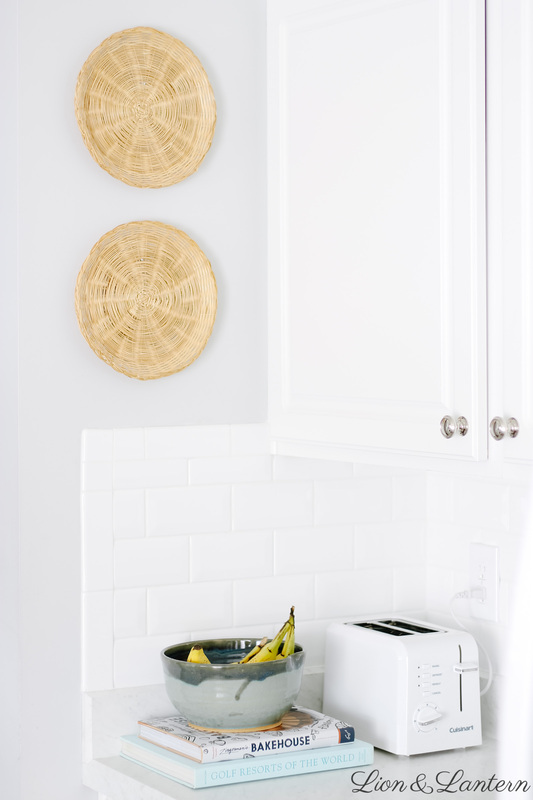 I love hunting for vintage baskets and books at thrift stores, and they make great kitchen accents. Recently I found these patterned Reader’s Digest books, the Golf Resorts of the World coffee table book, and the woven plate chargers at Goodwill! 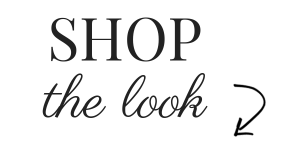 Check out local thrift stores for affordable decor. 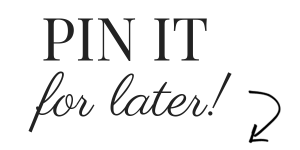 Alternatively, Etsy is a great resource for vintage pieces. 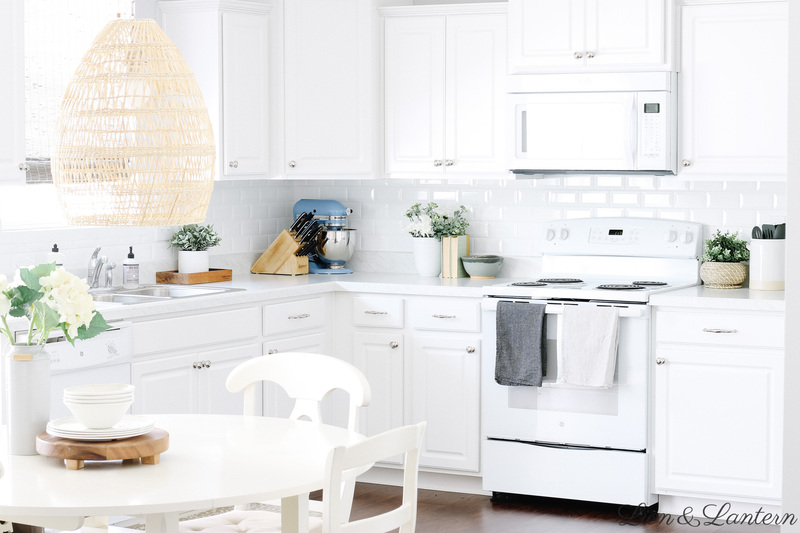 Another way to add interest to a white kitchen by styling pieces that you already own and use. 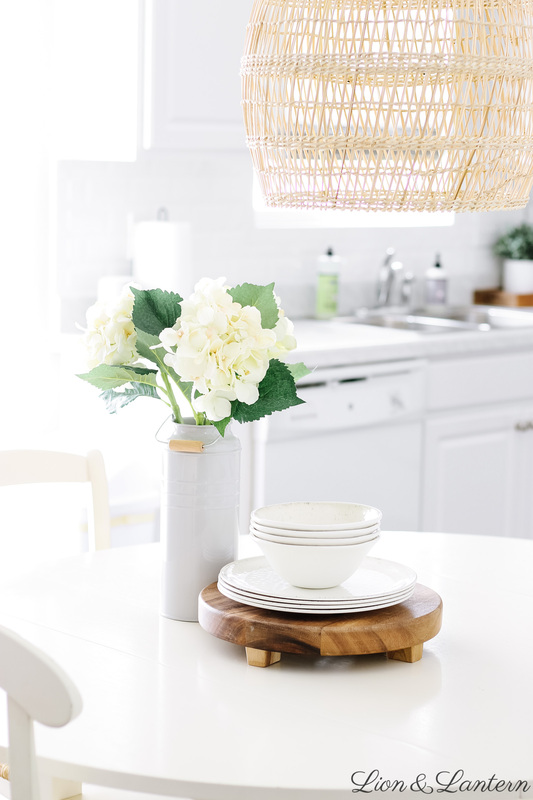 This footed wooden tray usually holds our napkins, salt, and pepper, but here I brought out some plates and bowls to create a simple vignette. 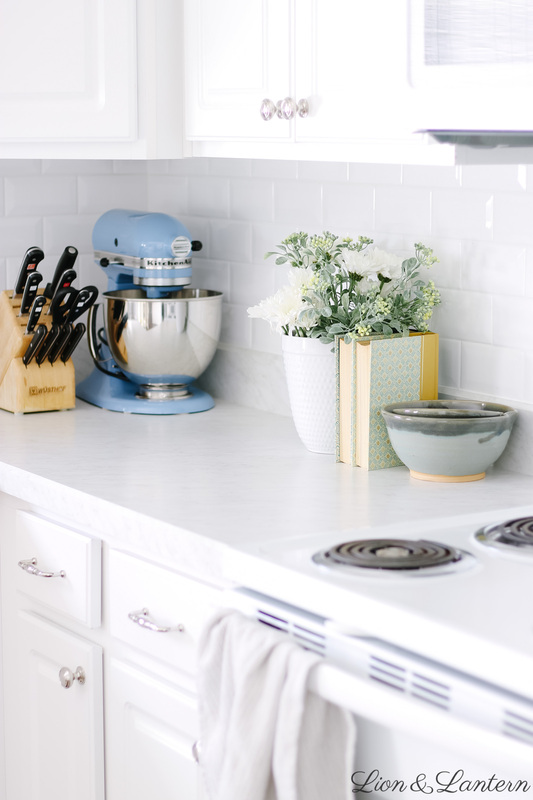 On our counters, I keep our KitchenAid Mixer and Wushtof knives out because I like the pop of color and the warm wood tone of the knife block. Practical AND pretty! Finally, I styled these beautiful blue bowls that my husband’s aunt made for us (isn’t she amazing?). They are too lovely to keep in the cupboards. 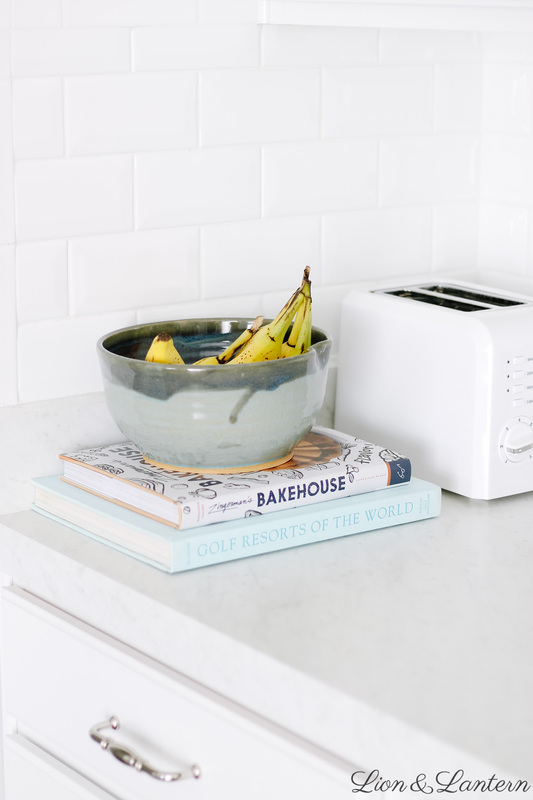 See what pieces you already have that can spice up your kitchen! 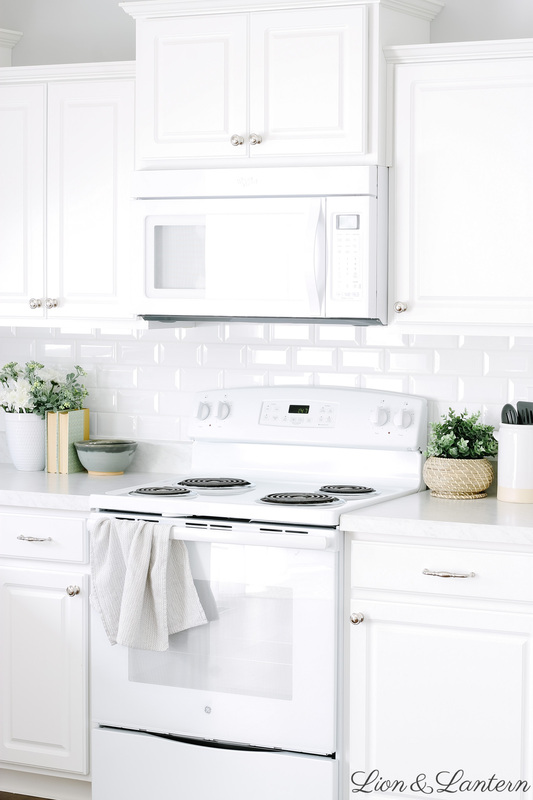 Finally, one of the best ways to adorn a neutral kitchen is with textures, patterns, and greenery. 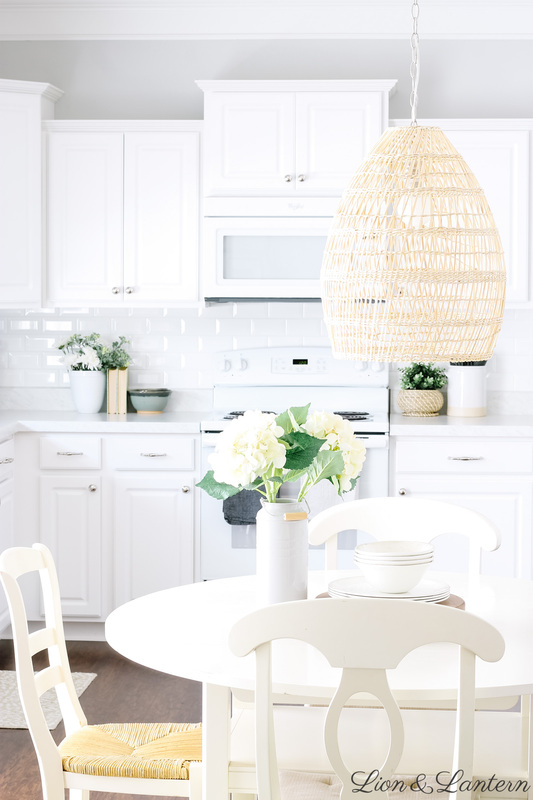 Our basket weave bamboo pendant adds so much warmth to this space (I wrote a post all about budget textured pendant lights here!) I like swapping out towels for a new look, and use fresh and faux greenery to add a natural pop of color. 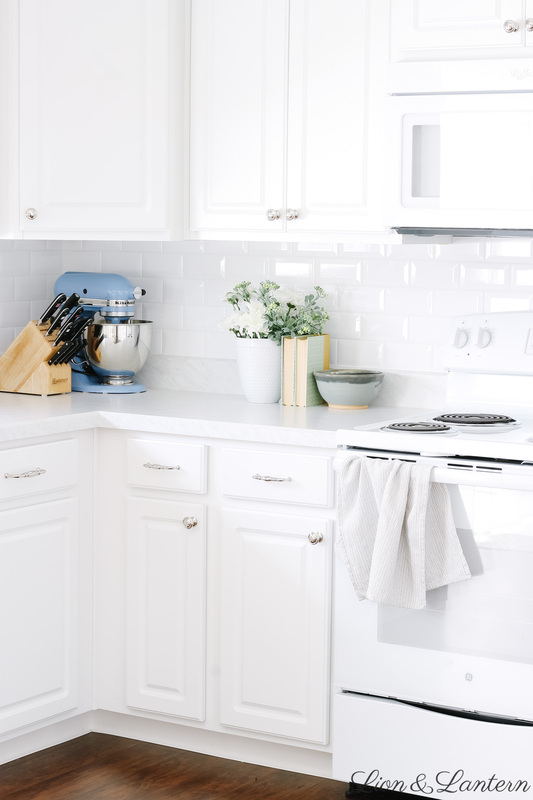 If you missed my Spring Home Tour, be sure to check out all of the springy inspiration from 30 home decor bloggers!